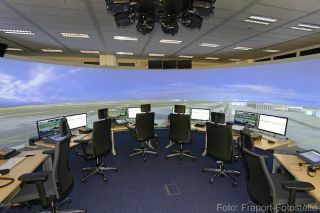 The system is being used to manage and control the demanding 24/7 operations of the airport complex. After detailed collaboration between IHSE and Fraport, the decision was made to install four Draco tera compact matrix switches to distribute data to the control center and three tera compact matrix switches to be used in the companies training rooms for apron simulation. Frankfurt Airport is the largest airport in Germany and the third largest in Europe handling approximately 58 million passengers per year. The complex itself covers 23 square kilometers and houses over 500 companies and institutions with approximately 78,000 employees. Fraport AG provides facilities to major airline companies as well as the German Air Navigation Services, public authorities and airport terminal concessions. The complete system utilizes four Draco tera compact 64 port Cat7 KVM switchers for the ACDC, three 48 port Cat7 switchers for the apron simulations and an assortment of point-to-point fiber extenders to the large display monitors located in the apron simulation rooms. Single Link DVI high definition video extenders (1920 x 1200) were used to transfer optimum image quality while also offering near zero delay. Multi-screen control allowed switching between different monitors by simply moving the mouse cursor. Each workstation provided the configuration of up to four virtual clients allowing control center operators access to HD video and its necessary data at any location any time. Apron trainee controllers were also able to concentrate on controlling simulations without distraction or interruption to the live system.